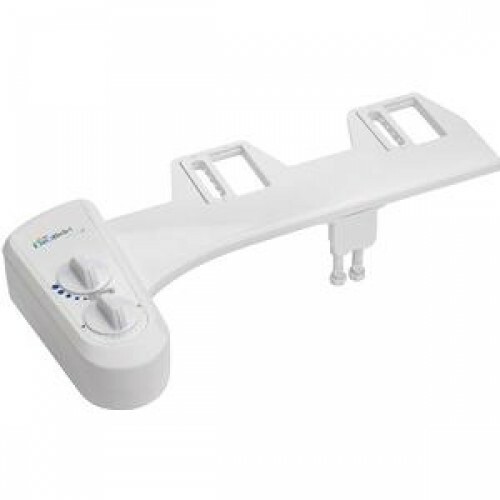 A bidet works operates by providing water to the posterior region after using the toilet, promoting better hygiene and leaving you with a better, cleaner feeling. BBC Inovation's Elite 3 Bidet Attachment with Dual Nozzle System is quick to assemble and easy to use with its dual-knob control system. The company's newest technology, called Positive Stepping Pressure Control (PSPC) gives you full control of the water pressure, changing your experience every time you use your own toilet. The Elite is assembled with a durable built-in UPC (Universal Plumbing Code) certified check valve, made to prevent backflow. The Elite3 is also made with high-end durable braised metal hose and a 3/8-inch T-valve for easier installation. The bidet comes in white for a better color match against your decor.